M3’s have always been fantastic handling cars but let’s face it; the US-spec E36 M3 is the only generation M3 that did not receive the same engine as its European counterpart. 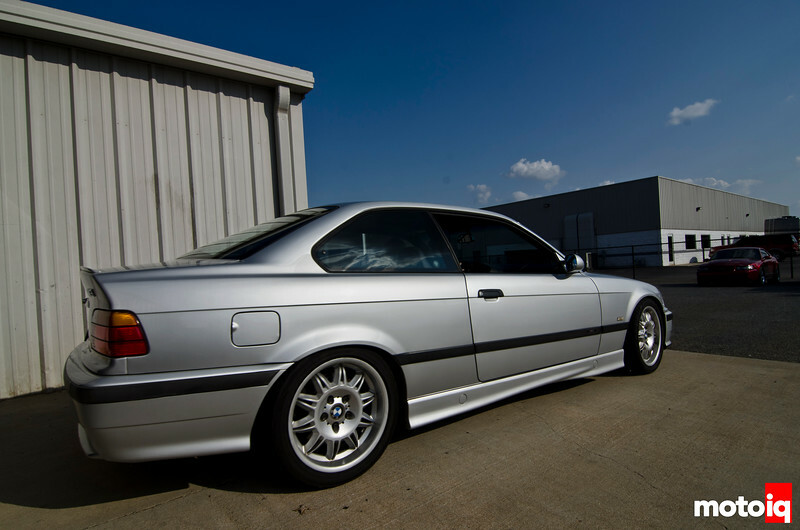 The E36 M3 came to the US in 1995 but did not come with the high-revving individual throttle bodied S50B30, but instead we got a 3.0L S50 motor which is essentially a stroked 325i motor with a revised aluminum head, single throttle body, and a single (intake-only) variable valve timing VANOS system that put out a mediocre 240hp. In 1996, the motor was stroked even further to 3.2L (S52) but was choked down by a restrictive intake manifold in attempts to bump low end and midrange torque for us Americans. While these changes did result in more torque and mid-range power, peak power remained unchanged from the 3.0L’s 240hp. This also made the S52 feel like it was running out of breath in the last 2,000rpm of its trip to a 6,800rpm redline. When compared to the 3.2L European S50B32 which pumped out 321hp, had individual throttle bodies, Dual VANOS, and a 7,600rpm redline, the US S52 does not do favorably. It doesn’t matter whether the import cars are from Japan or Germany, here in the States, we always seem to get the short end of the stick. 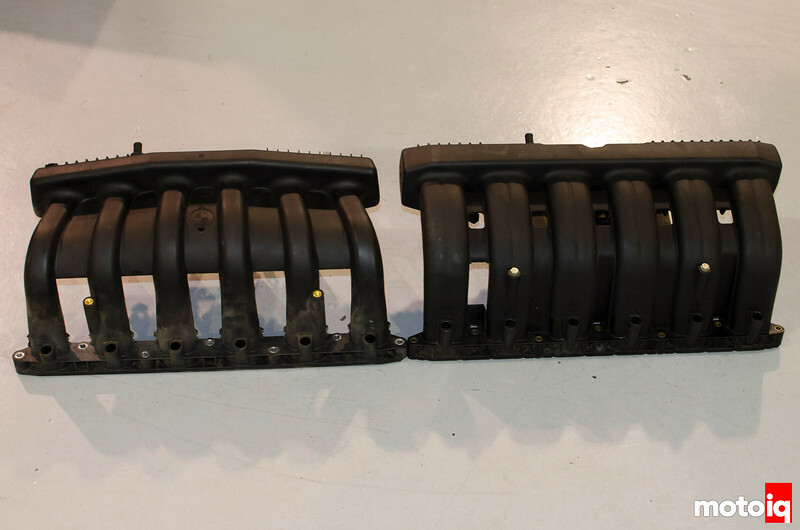 The M50 intake manifold (right) from the E36 325i and 3.0L M3 is a popular and inexpensive way to improve the high RPM breathing and power of the later 1996-1999 cars. The narrow intake runners on the 3.2L S52 (left) improve mid-range torque at the expense of choking the motor at high RPMs. 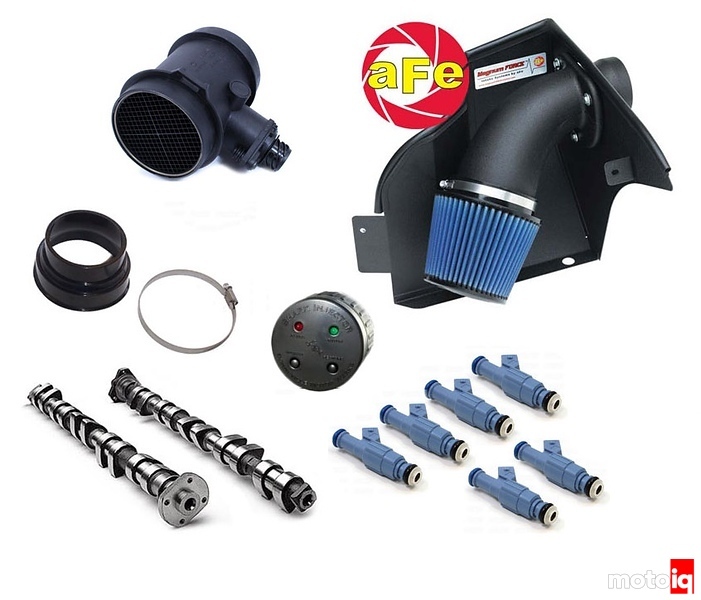 The Turner Motorsport Stage 3 system (which includes a larger 3.5” HFM, AFE cold air intake, 24lb Injectors, Shark Injector tune, and Schrick Cams) further frees up the intake of our S52 and provides more fuel to take advantage of the added air to make power closer to what we should have had in the first place. Rumors and dyno charts fill the internet on the positives and negatives of this swap with claims of 5-20hp gains, huge losses in mid-range torque, and many subjective opinions on the difference in feel. 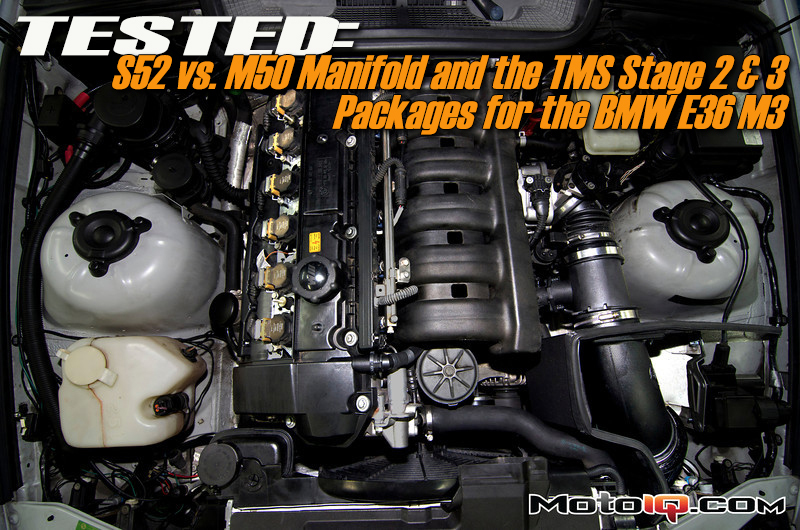 To dispel the myths we did back-to-back testing of the stock 3.2L manifold to the M50 manifold as well as the Turner Motorsport Stage 2 (which includes a 3.5” HFM, 24lb injectors, an AFE cold-air intake, and a tuned Shark Injector) all in the same day, on the same dyno for a true test of this commonly misunderstood modification. For kicks we went a step further and installed a set of Schrick cams with a new Shark tune (Turner Stage 3) in an attempt to come even closer to the European S50B32’s numbers. Our test car is my personal 1999 BMW M3 which has seen everything from track time, to LA stop and go traffic, to a coast to coast drive to end up in North Carolina. The car has a bone stock drivetrain, and 199,000 hard miles under its belt. Prior to this test the only modifications were a fan delete (uses a radiator mounted electric SPAL fan) and a K&N Drop-in air filter.